The bustling city of Madrid is a city of elegant boulevards, historic palaces and plazas and rich European art. Spain is also home to many other historic regional cities, towns and scenic countryside. 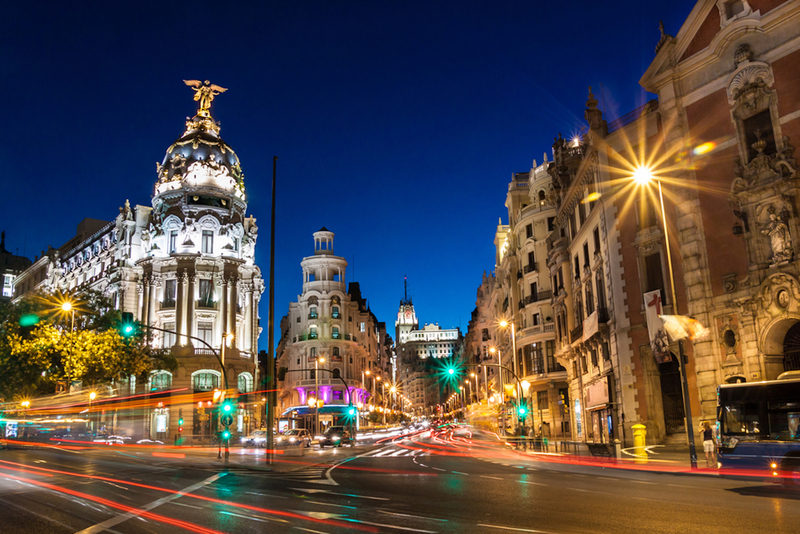 Lock in a cheap price to hire a car at Madrid Airport with DriveNow and get ready to explore one of Europe’s most popular destinations outside the capital. Here are five places to visit after you’ve explored Madrid. Five and a half hours south of Madrid. When people think of Spain’s beaches, most imagine the Mediterranean’s crowded seaside resorts. However, El Parque Natural del Cabo de Gato is a stunning stretch of coastline where you can discover flawless, tranquil beaches without the crowds. This area in sunny Almeria comprises of quaint villages, green mountains, rocky cliffs, sandy beaches and stunning blue waters. Three hours south of Madrid. Travel south to the beautiful province of Jaen to witness one of Spain’s earliest examples of the Renaissance style. Stunning, historic chapels, mansions and plazas grace almost every street. It’s not hard to understand why these attractions have earned Ubeda its title as a UNESCO World Heritage-listed site. The smaller, but still beautiful Baeza is just a 10 minute drive away. Four and a half hours south of Madrid. This is an area that’s definitely off the beaten path. The most fascinating aspect of this town is the fact that most of its inhabitants have lived underground for hundreds of years to escape the scorching heat. Guadix actually has the highest concentration of cave dwellings in Spain. You can drive through the area or explore by foot. You can even spend a night in one of these caves, and check out ones that have been modernised to include marble floors, luxury furniture and even internet connection. Six hours north of Madrid. The ‘peaks of Europe’ mountain range is just 20km inland from the north coast of Spain. It’s an absolute haven for hikers and rock climbers. Imagine snow-capped mountain peaks, wildlife grazing beside reflective lakes, and even traditional medieval buildings in villages scattered across the area. The mountains are rich in flora and fauna. They’re even home to a small number of Cantabrian brown bears, as well as wolves and eagles. Four and a half hours north west of Madrid. Discover what’s now left of the Roman Empire’s largest and most important gold mine. Las Medulas was the main source of gold for the entire Roman Empire. It’s another UNESCO World Heritage Site, with scenic and unforgettable views from the Mirador de Orellan observation deck. Las Medulas is iconic because of the unique and dramatic burnt orange peaks, which are like no other in Europe. Spring is in the air and summer is just around the corner. What better way to spend this marvelCous time of year, other than with one of these New South Wales country adventures. Hire a cheap car rental from Sydney Airport, then embark on a trip to regional New South Wales. These great country adventures are within a few hours’ drive from Sydney. Tamworth The regional town that’s home to the famous Golden Guitar comes alive every January comes alive with the Tamworth Country Music Festival. It’s 10 days of 700 performers, including some of country music’s biggest names like Troy Cassar-Daley and Kasey Chambers. Most of the events are free. When this music mania is over there are scenic lookouts, museums, bars and beer tasting experiences to enjoy. Hunter Valley Just two hours north of Sydney is one of the state’s most romantic and relaxing country adventures. The Hunter Valley is one of Australia’s most famous wine growing regions….